I'm happy to report that the Elvis Presley Fan Club of Great Britain got it right this time. Promised Land will be one of the upcoming releases from the Follow That Dream label available early December. And not only that. Elvis Sings The Wonderful World Of Christmas is due for release at the same time. This means that three of the four titles I speculated about in January will receive the FTD classic album treatment this year. 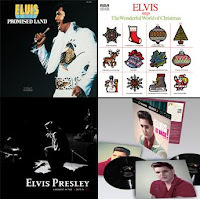 In addition to Promised Land and Elvis Sings The Wonderful World Of Christmas, FTD is also releasing a vinyl version of Elvis Is Back, as well as a 192-page book, A Moment in Time, that promises a stunning look at four days of Elvis’ life in 1956. It's going to be a Christmas, Elvis style, that's for sure! Just check out the tracklists for Promised Land and Elvis Sings The Wonderful World Of Christmas below. 20 You Asked Me To – ? 25 You Asked Me To – ? 02 You Asked Me To – ? 17 There’s A Honky Tonk Angel – takes ? 20 Thinking About You – ?